Visit any sheriff’s office, police department, or federal law enforcement agency today and you are bound to meet men and women who are veterans from our most recent wars. 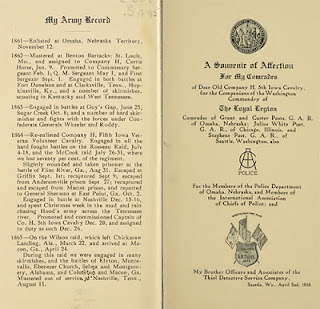 This overlapping tradition of service has been a part of law enforcement since the very beginning. Law enforcement officers have served in every war since the American Revolution, and some veterans from every war have gone on to serve in law enforcement. This November as our nation honors and remembers the veterans of all our wars, the National Law Enforcement Museum would like to hear from the many law enforcement officers who have also served in the military. Tell us your story in the "Post a Comment" section below. 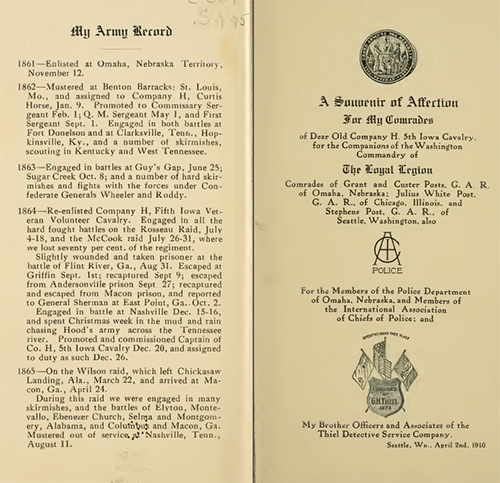 To start you off, here’s the story of a veteran who fought for his country 150 years ago and who went on to a distinguished career in law enforcement. Webber Seavey was a Nebraska native who enlisted in the Army at the start of the Civil War when he was 20 years old. He was assigned to Company H, 5th Iowa Cavalry and served with the 5th through the entire four years of the war. Seavey and his regiment joined the many other Westerners who marched with U.S. General William T. Sherman through Georgia. He participated in numerous skirmishes and battles and escaped from Confederate Prisons (one of which was the infamous Andersonville) twice. During those four years, he was gradually promoted from the rank of private to captain. After the war, Seavey traveled the world and made his fortune, finally returning to his native Nebraska in the 1880s. 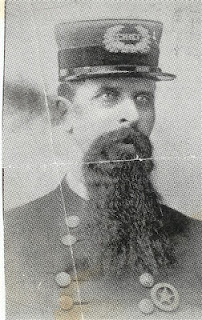 In 1887, he was appointed Chief of the Omaha Police Department. allegiances to both military and law enforcement. Seavey went on to create one of the most professional police forces in the western United States. Many of Seavey’s ideas were ahead of his time, including the establishment of a public fund to help the families of officers wounded or killed on the job. Seavey was also the driving force behind the establishment of the National Chiefs of Police Union, today known as the International Association of Chiefs of Police (IACP). He sent letters to thousands of police chiefs inviting them to Chicago for a meeting during the 1893 Columbian Exposition. Fittingly, Seavey was elected the first president of what would become the IACP and the association’s annual award for innovative policing practices still bears his name today.